While it's certainly welcome news that home sales are up in the Twin Cities metro, there's a big caveat to keep in mind pertaining to price points. All of the growth in sales can be found in the lower price ranges where, not coincidentally, foreclosure and short sales are more common. The largest drops in home sales can be found in the price ranges above $350,000 where, not coincidentally, higher jumbo mortgage rates are charged to borrowers. The inventory of homes for sale is now lower than it was a year ago for every price range except homes under $120,000, where it is still up 38.1 percent from this time last year. 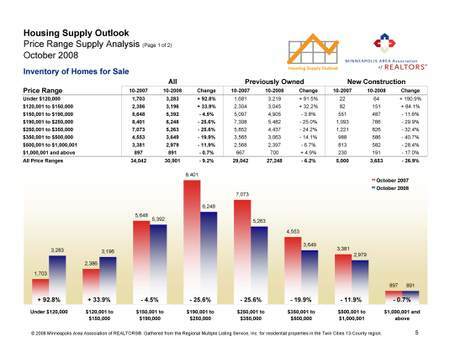 Click here to view the full Housing Supply Outlook. Thanks to increased home sales and declining new listings the January Months Supply of Inventory dropped to 7.6, 9.3 percent below the same time last year. The lowest months supply can be found in single-family detached properties, which currently sits at 7.0. The highest can be found in condominiums—a hearty 11.4 months of supply is available in that segment. The lower price ranges continue to see a growing share of market activity. Home sales below $150,000 have more than doubled in the last year, jumping 133.1 percent. The lion's share of homes being sold in these price ranges are lender-mediated foreclosures and short sales. As a result of this growing phenomenon, prices continue to soften. The Average Price Per Square Foot over the last twelve months is 14.5 percent lower than the twelve months before that. The largest declines can be seen in single-family detached properties. Click here for the full January Housing Supply Outlook. Booyah. One of the starkest pictures found in today's Twin Cities housing market is the difference in sales activity by property type. Over the last twelve months, single-family detached homes have increased over the same period a year prior by 7.1 percent. On the other hand, townhome sales have declined by 11.4 percent and condominium sales have declined by 24.3 percent. The culprit for this huge difference between single-family homes and attached living arrangements is foreclosures and short sales. Consumer demand to purchase these lender-mediated properties is growing, and our research indicates that the single-family detached market has been affected more dramatically by this trend than other property types. On a related note, single-family detached homes are seeing the largest declines in sales price and price per square foot for the same reason. Whatever opportunities there are in the lower price ranges are quickly being snatched up. While the inventory of properties for sale under $120,000 has increased by 83.9 percent in the last year, home sales in that segment have increased by 195.3 during the same time period. The net effect of this explosive sales activity is that the Months Supply of Inventory in this price range has dropped a whopping 37.7 percent in the last year to its current rate of 6.6 months -- easily the lowest of all price ranges we track. A hearty 66.6 percent of the current inventory in this price range is lender-mediated foreclosures and short sales. The overall Months Supply of Inventory declined to 9.0 months, a drop of 5.2 percent from the same time last year. Condominiums and townhomes have seen an increase in Months Supply in the last year, while single-family detached homes have experienced a decline of 10.2 percent. 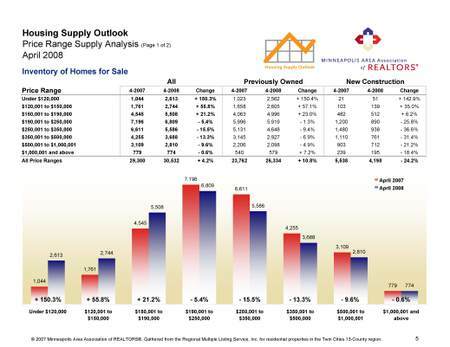 Click here for the full November Housing Supply Outlook. The months supply of total inventory in the Twin Cities housing market fell slightly to 9.5 months for October, which is 3.9 percent below last October. While the downward year-over-year movement is encouraging, we are still far from a balanced market. Click here to view the full October Housing Supply Outlook. The inventory of homes for sale continues to drop relative to one year ago, now 5.0 percent lower. Condominiums have seen the largest drop, falling close to 10 percent from this time last year. Unfortunately, they've also seen the largest decline in sales -- muting the good news for condo sellers. Home values continue to experience downward pressure as foreclosures and short sales (i.e. lender-mediated properties) work their way through the sales cycle. New construction homes, which are very rarely lender-mediated, aren't experiencing the same overall value decline. A growing portion of market activity continues in the lower price ranges. The segments below $190,000 continue to heat up in both supply and demand, while above that watermark they're tapering off. The big story in the Twin Cities housing market this month is that the total marketwide inventory of homes for sale is now below a year ago. A closer look at property categories paints a more nuanced picture. The number of previously owned homes is actually up 1.2 percent from last year, while new construction inventory is down a whopping 26.3 percent (1,422 units). Condominiums are down the most, with 7.6 percent less inventory than a year ago, while single-family detached homes are down the least—only 2.3 percent for now. With foreclosures and short sales maintaining their increased market share and single-family detached homes a more common foreclosure type, this is not shocking. Inventory below $190,000 is actually up 33.4 percent from last year, while properties listed above that mark are down 15.9 percent. Once again, the prevelance of foreclosures and short sales is undoubtedly having an impact here. Click here to view the full June Housing Supply Outlook. The entire housing market—in both supply and demand—is seeing a downward shift in activity towards the lower price ranges, likely a result of the increasing market share of foreclosures and short sales. Compared to this time last year, the supply of homes under $150,000 is up 87.2 percent and home sales in that price range are up 49.8 percent. There is far less happening in the middle and upper price brackets. A much smaller share of condominiums are foreclosures or short sales than the townhouse and single-family detached markets. It's not a coincidence then that the average sales price and price per square foot of condos is actually holding relatively steady and not seeing dramatic overall value declines. New construction inventory is still down significantly—21.7 percent behind this time last year, to be exact. The months supply of new construction inventory is only up 2.8 percent in the last year to 11.4 months, compared to a 24.0 percent increase for the previously owned market. 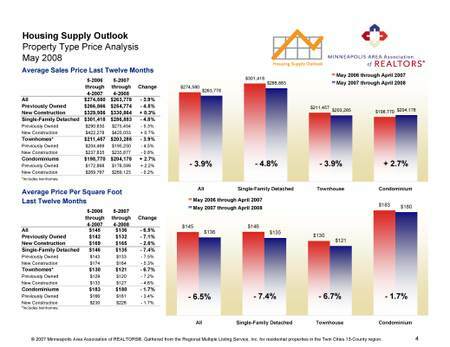 The April Housing Supply Outlook is ready to rock. That's code for "we just put it up on the website, so you should read it n' stuff, or whatever." As usual, here's a quick list of what to watch for, in the interest of making your time with this large and complex report as efficient and productive as possible. Remember all that talk about the record number of houses on the market and the ridiculous plethora of inventory that buyers could linger over and slowly cherry-pick from? That was then and this is now. The total number of homes on the market today compared to the same time a year ago is only 4.2 percent higher—a much lower number than we've seen over the last three years. If you compare the number of homes for sale today with the same time a year ago, five of the eight price ranges we track actually have less on the market. Only the three price ranges under $190,000 have more on the market now than they did a year ago. Home sellers who are priced at $190,000 or above actually have less competition for buyers this year than they did last year. The condo market continues to show early signs of bottoming out. Inventory is down and prices are stablizing after two years of decline. With that said, sales of condos remain sluggish and likely won't spike dramatically upwards anytime soon. There has been massive growth in the inventory of homes for sale in the lower price ranges below $190,000. This is very likely a combination of natural price depreciation knocking homes down into the lower ranges and the preponderance of priced-to-move REO properties. The two property type categories with the highest months supply of inventory are new construction single-family detached homes (12.0 months) and previously-owned condominums (11.3 months). The two categories with the lowest months supply of inventory are previously owned single-family detached homes (8.7 months) and previously owned townhomes (9.3 months). Despite the lowest decline in unit sales of any property type, single-family homes are currently seeing the largest declines in value, 5.6 percent down in price per square foot when comparing home sales for the last twelve months to the previous twelve months before that. Click here for the full March Housing Supply Outlook. Condominium supply continues to fall—the number of units for sale in the Twin Cities metro area has declined by 4.7 percent from this time last year. The entirety of that decline is due to a precipitious fall in new condo projects. There's a direct correlation between home prices and change in Months Supply from one year ago, from top to bottom. The lowest price ranges have experienced the most growth in Months Supply and the highest price ranges have experienced the least growth. Part of this likely due to steady price reductions in homes adding new supply to the ranges directly below the home's previous value. Not coincidentally, the lower price ranges features the lowest figures for Percent of Original List Price Received at Sale. Sellers in those ranges are being forced to make steeper price reductions before sale. 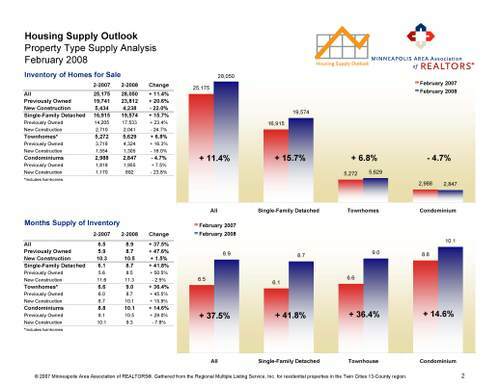 Click here for the full February 2008 Housing Supply Outlook.